If you’re using the British rail system for the first time, or if you’re unaccustomed to doing so – you’re the rail network’s number one favourite customer. Why? Because you’re overpaying wildly. Train travel in this country is expensive enough to start with – the priciest in Europe. So it’s a tooth-loosening slap in the face to discover that you’re paying even more when you buy tickets in a hurry. It’s deeply insulting – and yet it’s a fact. You arrive at point A, and you need to get to point B. In other parts of the world, this is simply a case of trundling to a rail-ticket office and buying a ticket for the connecting leg of your journey. It’s a no-brainer – the way we’re taught to travel, the sensible, creative way of travelling in other countries, and it’s often how independent travellers keep moving round the world without collapsing under a ton of planning. It’s the way to snaffle last-minute, last-second deals, to haggle and flutter eyelashes and give vendors the full wattage of your charm and negotiation skills. But this is Britain. We do things differently here. Unfortunately. So, here are a few golden rules to follow if you’re planning to use the British rail system. It’s a long shot, but it’s possible that for the day you’re wanting to travel, someone is either selling or giving away just the tickets you need. This could save you a good slice of the cost of travel, or even all of it. http://www.gumtree.com – Choose your departure city, and check under “Tickets”. http://www.freecycle.org – Find the group for the city you’re leaving & check the last 5 days of posts. http://tickets.shop.ebay.co.uk/ – eBay UK’s ticket deals. If you’re in a rush, you’ll cut corners and spent money unnecessarily. You won’t have time to browse around for deals and experiment with ticket options, and you’ll probably say those fatal words “Oh, right now I just don’t care“. The following three tips all require a bit of extra time – and they’ll repay your budget twofold, at the very least. This is the biggie. Worship at the foot of this rule at all times. It is absolutely vital that you follow it if you want to avoid paying absurdly inflated prices. To demonstrate: when I was returning from Greece in 2007, I had all my tickets prebooked including my final connection from London King’s Cross to York, a single ticket costing £19. Unfortunately, my overnight Trenitalia connection from Bologna to Paris stopped on the tracks for an hour (no explanation why) and consequently I missed both my Eurostar to London from Gare du Nord and my single back to York. I transferred over my Eurostar with no problems, but my London to York ticket was sunk. I couldn’t transfer it because it was an Advance ticket, and I had to buy a standard single on the day for £87. And yes, this is typical. Unless you’re taking a very short jaunt by UK rail, buy an Advance ticket (in advance, obviously – they’re not available on the day) and hunt down the best deal, choosing your own path between maximum flexibility (a more expensive refundable ticket you can use on a variety of trains) and price (the Advance tickets are much cheaper, but require you to be on a particular train and a particular time – and if you’re not, tough luck, no refund). If you plan ahead, you’ll save at least half the price you’d pay on the day, and usually much more. If you find yourself checking ticket prices at Trainline, look for a link that says “2 singles could be cheaper”. They’re not kidding. This is the second most important rule to idolize and shout from the rooftops. Return tickets may be less of a hassle, but they’ll probably cost you a lot more than two well-chosen singles. (Oh, and try to book those singles with the rail operator directly, because Trainline charge you a fee, especially if you pay by credit card). Remember those Advance tickets mentioned in the previous point? They only come as Singles. So they’re your best bet here. It’s not that there’s any extra charges with a Return. The problem is that a Return locks you into one ticket type – either the equivalent of 2 standard singles (peak or offpeak), or 2 first-class singles (ditto). No Advance tickets – which means, no massive savings if you book a few weeks or more before you arrive. You can’t factor in any deals you might find. You’re straitjacketed into one pricing option – and all the bargains are out of reach. But sometimes, you may have no choice in the matter. You may be running late in booking, all the Single tickets may have been nabbed already. The only option may be to buy a Return, and pout with frustration as it savages your travel budget. Sad face. But if you’re booking early enough, always, always check the Singles and best deals first. This is another reason you need that extra bit of time when you’re booking your journey. And here’s where it gets really crazy. Most train journeys aren’t strictly A to B – they have stops. Your journey is therefore a string of legs. In a rational, logical corner of the world, your full-journey singles and returns would be the sum of the price of all those legs put together: A + B + C + D = Ticket. But this is Britain. 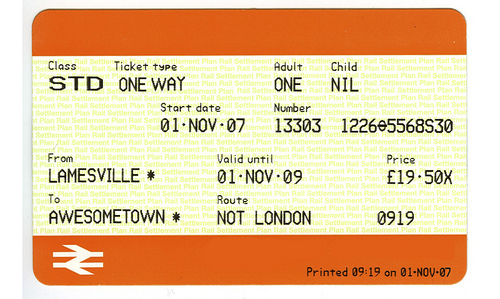 The price of individual tickets for individual legs, put together, can be much cheaper than an overarching full journey. It’s another reason you need some of that extra time to book your tickets – and if you’re making a long journey across the UK, it can save you shedloads. Here’s the technique in action. It’s a wildly eccentric system, agreed, and if you’re not careful it will take you to the cleaners – but it does encourage good thrifty habits and an open-eyed approach to rail travel, and for that reason, I’m perversely fond of it. But I don’t trust it one bit. Images: chantrybee, slideshow bob, Joe Dunkley, maz hewitt, and Woodvines.